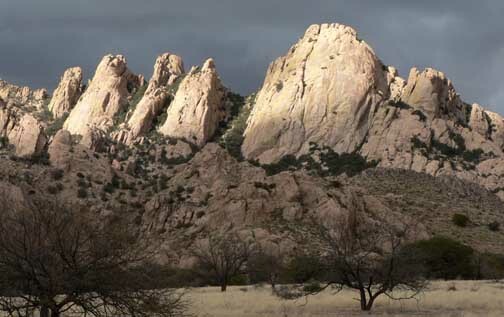 Cochise Stronghold is an awesome collection of granite domes in the Dragoon Mountains of southeast Arizona. Sheepshead is one of the larger formations on the west side of the Stronghold and the formation offers many great multi-pitch routes. For our first visit to the Stronghold, Allison and I chose the 5-pitch, 5.8 climb called "Ewephoria". The weather forecast, when we left Los Alamos on Thursday night along with Roger and Mark, was for windy and cooler conditions with a chance of showers later in the weekend. However, given the very dry winter and having heard many forecasts for showers in the southwest this winter, we had little confidence in the forecast and forged ahead as planned anyway. Not only were we not confident in the forecast, I was also very excited for my first visit to Cochise and therefore not likely to bail even with the poor forecast. So the trip was on. We left Los Alamos at 5:00pm sharp on Thursday in Roger's Toyota Tundra truck geared and supplied up for four days of climbing and a planned return of Monday night. We headed south on I-25 and then west on I-10 before finally arriving at Cochise a little before 2:00am Friday morning. It had been a long 8.5 hours on the road and we were ready for sleep. The temperature was around 48F and the wind was still. A nearly full moon illuminated the awesome granite domes of Cochise. After breakfast burritos and coffee made on the Coleman stove on the tailgate of the truck on Friday morning we started our approach hike to the base of Sheepshead around 9:15am. The day was cool and a bit breezy but we were optimistic it would warm up because few clouds were in the sky. The approach hike takes about 40 minutes to the base of Sheepshead and the "Ewephoria" route. Roger had climbed "Ewephoria" just a month and a half previously and Mark had spent some time on the rock of Cochise on two previous trips therefore Roger and Mark would be taking on a route called "Too Tough to Die", 5.9+, just a hundred feet to our right on the same formation as their warm-up route. 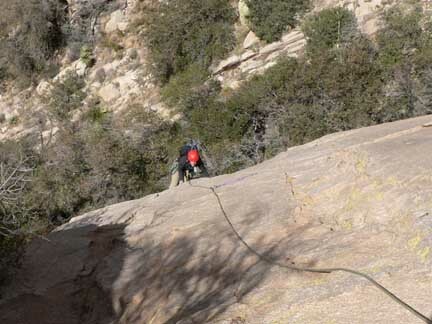 Allison and I had hoped to climbed "Too Tough to Die" later in the weekend if time would permit but were looking forward to our introduction to Cochise the easier, yet highly regarded route, "Ewephoria". After packing our descent shoes, snacks, water and light shell jackets into one pack, I started up the first pitch of "Ewephoria" at 10:30am. Looking up the first pitch of Ewephoria. The first pitch took us up a left-leaning, right-facing ramp/corner for about 45m to a bomber two-bolt belay. 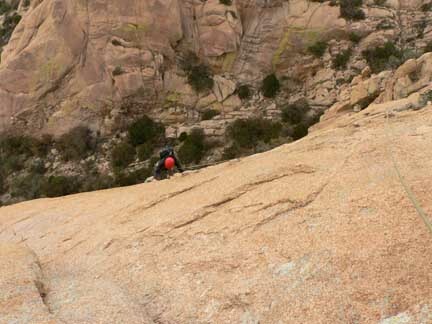 At 5.6, the climbing on the first pitch was fairly low-angle initially but certainly required attention. I was able to get about six pieces of pro in ranging from a #2 camalot to smaller cams and a couple of good nuts. At the top of the ramp I exited left to a single bolt on a face before reaching the bolted belay ledge. I had opted to wear only a long-sleeved cycling jersey and soft shell pants on the climb and was already beginning to regret this a bit. The climb faces westerly and with the wind and now thick, intermittent clouds in the sky, I was already a bit chilly. Allison made quick work up the first pitch with the exception of the number 8 Wild Country nut I had placed giving her a hard time briefly. When she reached the belay she passed on the gear to me and we flipped the rope so I could again lead the next pitch. Pitch 2 started out with a move left and then up to a small seam where I was able to place a small cam for protection. After about 10 feet of the seam the climbing turned to nicely featured climbing to a number of bolts to the second belay, another bomber bolted belay with small ledges. About halfway through the second pitch I the clouds cleared briefly and I entered the sun. Ah, as always the sunlight gave me a great boots in warmth as well as mental state. It's really hard to beat the kind of energy that entering sunlight will give you on an alpine climb. I reached the belay after enjoying the fun climbing on pitch 2. Allison and I had chose to use FRS radios for communication because of the wind and this was working out very well. I radioed to her that I was off belay and then belayed her up. Working with bolted belays sure makes things much more efficient! Allison coming up the nicely featured pitch 2. Looking up pitch 3 Allison decided she wanted to try leading it. For this decision I was proud. While she leads 5.10 sport climbs she had never lead a pitch on a multi-pitch climb nor had she lead any friction climbs before. Both of which this next pitch would be. The very well bolted pitch 3 gave her the opportunity. Bolts were spaced about every 4-6 feet so it would be a safe lead. And, if Allison got up a ways and wasn't comfortable, in the first half of the pitch, I could lower her back down and finish the climb if necessary. She racked up with only 13 quickdraws for her rack and started off. The first few moves go up along the right edge of a polished water streak requiring Allison to place her left foot and hand on the more polished and smooth rock. She moved up steadily to the second bolt before giving the next few moves some good thought. When she finally made the moves up her left foot lost its purchase and she slipped off. I caught her quickly making for a short leader fall. I was really proud of her when she gathered her composure and started backup. She was picking some tough conditions for her first multi-pitch lead given the cold temperature, strong winds and intermittent sunlight on friction climbing but she persevered and climbed nicely up to about the eighth bolt. At the eighth bolt the climbing steepens as the route goes through a brief headwall. After giving this some thought Allison decided she had better not lead it today and I lowered her back down to the belay ledge. Allison reaching her high point on lead of pitch 3. It was nice for me to be on top rope for a bit as I head up the first part of pitch three cleaning the quickdraws that Allison had placed. I found the climbing to be a bit interesting for 5.7 or whatever it was rated and could really appreciate Allison's lead. Leading friction is a very different game than leading steep, featured climbing and she had done well. Once I reached her high point at the eighth bolt I found the steepening climbing to give me some good pauses in this wind and cold temperature. But after passing four more bolts and getting up on to the very featured face above the headwall where I was able to place a small cam between two chickenheads, I was really enjoying the easy climbing to the belay despite the strengthening winds. I could also now see Roger and Mark to my right on their route. I again clipped two bomber bolts for the belay on the face. The wind was now really whipping and in my single layer, long-sleeved jersey I was getting cold. I was glad I carried my lightweight gloves up with me but couldn't wait for Allison to reach the belay so I could get my shell jacket out of the pack. Allison looked like she was having a great time as she climbed up this third pitch. When she did arrive at the belay we both donned our shell jackets before I lead up the fourth pitch. 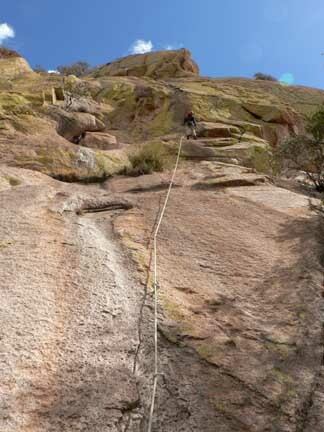 This pitch started out with fun, easy and runout featured face climbing for about 30 feet before clipping a bolt below a steepening, friction section. The next four bolts were ideally placed between attention-getting friction moves. One move in particular gave me quite a bit of pause before I completely committed to it. Each time I would start to commit to the move, a gust of wind would change my mind and I'd stay put on the two tiny edges below my feet. I finally committed to it and it went well but I was glad to clip that next bolt. The fourth belay was on a big ledge with, again, two bomber bolts as the anchor. Following the friction moves on pitch 4. Bolts were right where I wanted them and a couple of chickenheads allowed for good slings. Not long after I reached this big ledge Roger came up to the ledge on their route but we couldn't hold a conversation because of the wind noise! I enjoyed this ledge and set up Allison on an autoblock belay so that I could take my shoes off and move around a bit as I belayed her up. Mark was able to take a couple photos of her as she seconded this fourth pitch from his vantage on "Too Tough to Die". When Allison reached the belay we had a small decision to make-go straight up the 5.9+ last pitch of "Too Tough to die", which looked quite fun, or go up the standard finish in the 5.8 chimney to our right. Roger had highly recommended the last pitch of "Too Tough to Die" before we started climbing that morning for it's great position on an exposed arête and I really was interested in it. So the decision was made and I stole the last pitch of Roger and Mark's climb from them. This last pitch was awesome! It was well bolted and felt safe and took me over a couple of small roofs that involved some thin foot moves before getting on top of the slabby arête. When I got on top of the arête the wind hit me full bore and I couldn't' hear anything but the loud noise from my flapping shell jacket. I kept my right hand and right foot on the edge of the arête as I climbed past four bolts to the summit of Sheepshead. I opted to climb over a bit to get out of the wind instead of using the bolted belay station at the top of the formation. I found a great sitting belay in a large hueco just over the top and radioed to Fritzy that she was on belay. At that point Mark came atop the formation after leading the chimney pitch and shortly thereafter Allison arrived atop just before Roger. At 2:30pm we were all on the summit enjoying our sandwiches and snacks and finally out of the incessant wind for a bit! We signed in at the summit register, changed shoes and proceeded down the walk off route back to camp. The weather worsened that night with colder temperatures, some snow flurries and continued winds. The forecast was for more of the same with a snow advisory as well through Sunday into Monday. Given this situation we opted to head home Saturday morning to salvage the weekend. Admittedly it was a long drive for 5 pitches of climbing but it was an amazing climb with great company and the memories will be around indefinitely. We'll also make another trip down there very soon! 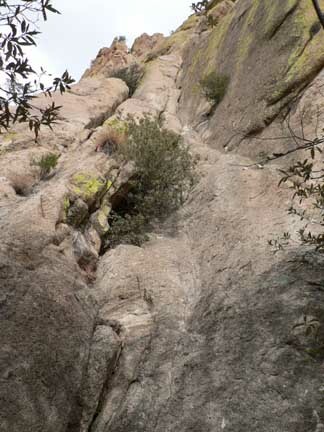 I can't wait to climb more of the enjoyable friction granite at Cochise. Written by Jason Halladay on 11 March 2006 for TheMountainInstitute.com.